Spring has sprung, and April is upon us. It’s now the perfect time to throw a raging 420 themed party. We’ve compiled a list of the best stoner party decorations and accessories across the web in order to make your event the most-anticipated gala of the year. From decorative balloons to pot party beer pong tables, Stoner Toolbox has got you covered. If you like to go the extra mile as a host, serve up some tasty treats for all your guests to enjoy. Nothing says “I’m ready to party” like a set of themed balloons. This classic and timeless decoration will bring all of the best party people to your door this 420. Perhaps the second-most important item at a stoner party (besides the ganja of course) is the snacks. Whether you plan to make special cookies or just some munchies, these cookie cutters will get you feeling festive. It’s a candle. Shaped like a joint. Enough said. While this is a classic for edibles, other fun ideas for your 420 party include making weed-shaped icicles for beverages or using this as a template for jello shots. BPA FREE, food safe silicone. Non-stick material allows for easy release and simple to clean. You can even put them in the dishwasher! If you’re really looking to take it to the next level, this is the single most important house party accessory, conveniently themed for your pot-fest. Let this 420 themed magic ball decide your fate this special day. Live in luxury (or at least pretend to) when you roll your party joints in these Benjamin rolling papers. Does not contain tobacco or nicotine. Roll up to the gig in style in this full-suit. You’re extra and you know it, and we love it. For the ladies, this nice rasta-colored dress is a perfect party pick. Take a new spin on a traditional masquerade party with these hippie stoner masks for party guests. Decorate your tasty treats with these artful cookie stamps. Party pleasers for sure! PROFESSIONAL “high” quality design, non-toxic material used to create cool cookie designs that look amazing and taste great! BPA FREE, food safe silicone. Non-stick material allows for easy release and simple to clean. Stainless steel cookie cutter that won’t rust. The silicone pieces and cookie cutter are dishwasher safe! The wooden handle should be hand washed. YUMMY TREATS: Can be used for stamping on cookies, edibles, fondants, chocolate snacks, butter patties and other amazing creations. Pulling on the Mardi Gras tradition, these beads are sure to add some extra festivities to your poppin’ party. Makes a great party accessory or gift! Looking for an original party activity? This card game is great to play in large groups and will have you and your friends laughing all night. Finally, be prepared to party well into the night with some mood-lighting provided by these glow in the dark pot leaves, reminiscent of your childhood bedroom (with a stoner-friendly twist). 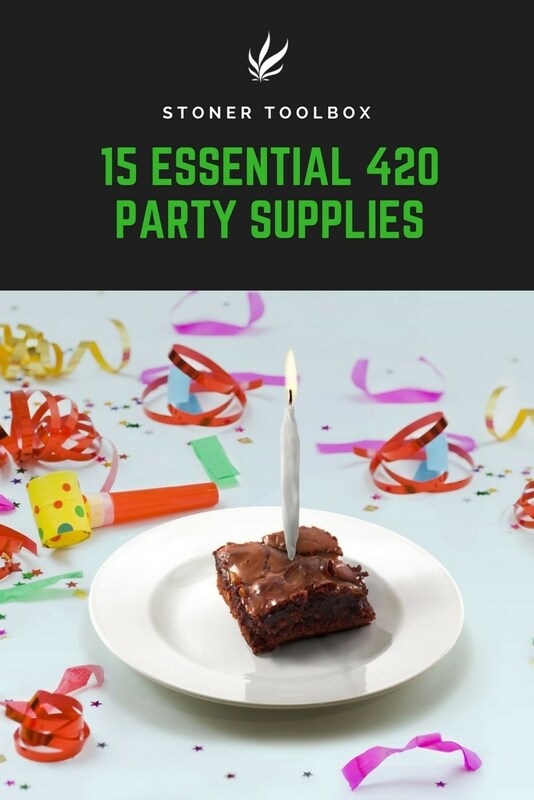 The post 15 Essential 420 Party Supplies appeared first on Stoner Toolbox. Previous Story Previous post: Trail Blazers guard Damian Lillard welcomes birth of son Damian Jr.